Sometimes I feel like a really bad mother…and also person. If I’ve learned anything thus far, it’s that some days are significantly harder than others. We are about eighteen weeks in. That translates (for those who are tired of all things pregnancy and kid related being calculated in weeks) to about 4.5 months. 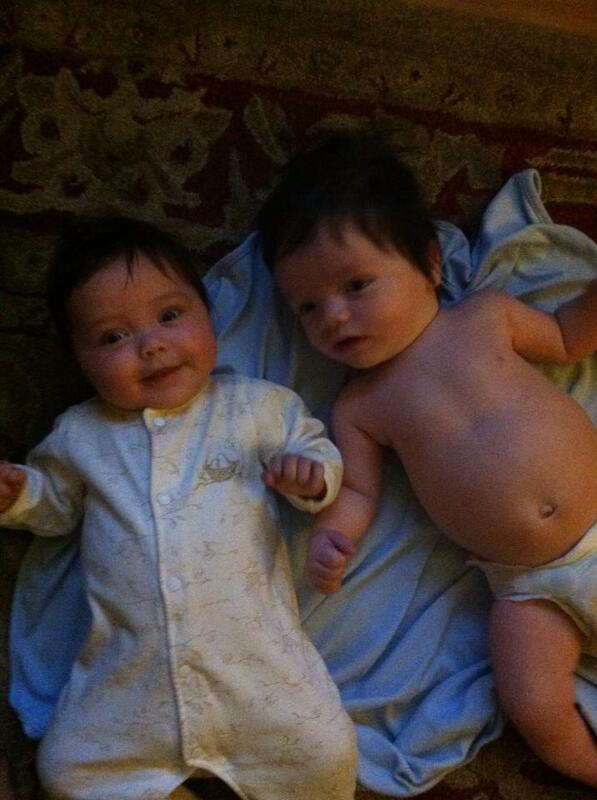 Remember though, these kids were seven weeks early so we are really looking at about 2.5 months old. Anyhow, as I was saying, some days are beautiful, perfect, God-affirming days. Others challenge me as a mother, as a wife, as a friend and frankly as a person. Take today. It’s Monday. This past weekend my husband and I went away and left the babies with my parents and sister. We took our two hound dogs (our original children) and headed to a relaxing weekend get-away. I was nervous going into it. I wasn’t sure I could spend two nights away from my babies. That said, we scheduled massages upon arrival and the moment my head touched the massage chair I remember thinking, “Yeah, I’m pretty certain I can do this.” That night we had a romantic dinner followed by a horse and carriage ride home. We drank wine and wore robes and turned off cell phones. As we were falling asleep that night, I began to have a little panic attack and felt desperately, maternally like I needed to get home immediately. Instead I rolled over, took a Tylenol PM and slept like a newborn baby. The next day we had a leisurely breakfast and took a long hike with our pups. We napped, we went to a beer garden, we ate another yummy dinner, hell we played Croquet! That evening we watched a movie and roasted s’mores by our fireside. Again, cut to me sleeping like a newborn. We came home Sunday fully rested and missing our babies like crazy. I felt certain that I had a renewed sense of patience and that I would be calm and collected for the week ahead. Today has been brutal. In the early days of our babies, it wasn’t so bad. Essentially, they ate and slept. On the same schedule. Now when one falls asleep, the other immediately wakes up. No matter what contraption we put them in, they cry. They want to interact with me each waking minute which is wonderful and fascinating but also exhausting and all encompassing. Guess what? Right now I am sitting in the guest room with the two dogs and the door shut. The babies are howling in the other room but I needed to get away. I don’t feel good about that. They are crying and they want their mamma and I know that if I go in and pick them up and play with them, they’ll be happy. But I am tired and overwhelmed. I’m wearing a gigantic tee-shirt and my husband’s boxers. It’s the middle of the afternoon. And yet I don’t know what to do. On the one hand, the thought of getting out of the house each day and going into work sounds wonderful. On the other hand, and weighing slightly heavier, the thought of handing my babies over to a daycare instructor and missing giggles and eye contact and sneezes breaks my heart. I am depressed sitting in my pjs at 1:26pm on a Monday afternoon while the world continues outside my window, and yet I’m not sure I’m ready to give up this time with them. I want to be a good mother-one who doesn’t lose her patience and doesn’t raise her voice, but I swear this is harder than I thought it was. I told my mom the other day that the best part of my weekend away was that there were 48 hours where nobody needed anything from me. Here at home one baby needs a pacifier, the other kicked their blanket off and is cold, the dog needs to pee and the other one wants water. Once all these tasks are completed and I finally sit down to work, a baby decides to wake up, another wants to sleep but has just spit up everywhere, the dog starts barking at the mailman and the second baby gets scared and starts crying. It’s never ending madness. And yet I’m not sure I could live without it. I know I am being hard on myself. I know that I am doing the best I can. I know that we-my husband and I-are doing the best we can. I also know that our babies are fine. If I don’t read Shakespeare aloud each afternoon, enroll them in baby French lessons and breastfeed them until they are ten, they will still be positive members of society. Hmm. On that note, I just realized it’s silent outside my door. Looks like everyone fell asleep-pacifier, blanket, spit-up and all.